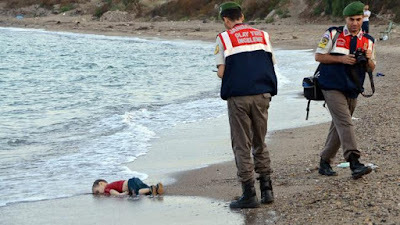 We have all seen the photos and footage of three year old Aylan Kurdi lying dead in the sand. His body was swept up onto the beach having fallen off a small / overcrowded boat, which was intended to take him to safety. It sparked an outpouring of worldwide sympathy for Syrians who have been welcomed to the "promised land" of Europe. The UK was accused of not doing enough or acting quickly. Tonight I complained about the hot water not working properly in my new home. And then I watched this and realised I have SO little to complain about. So little. We see you. We hear you. Help is COMING. I am drafting a blog post on the Global Goals - stay tuned!